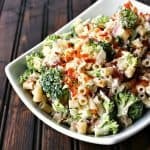 The pasta is balanced perfectly by a generous presence of crunchy, raw, bite-sized broccoli florets. The two are tossed with coarsely grated Cheddar cheese and a simple, creamy dressing made flavourful by crunchy bacon, mayonnaise, and red onion. Combine all of the ingredients in a mixing bowl. Cover with plastic wrap and allow to meld in the refrigerator for at least 30 minutes but up to 3 days before serving. Stir gently before serving.